BUFFALO, N.Y. (WKBW) — Buffalo Sabres general manager Jason Botterill made the decision to fire Phil Housley on Sunday morning, just hours after the 2018-2019 season came to an end. 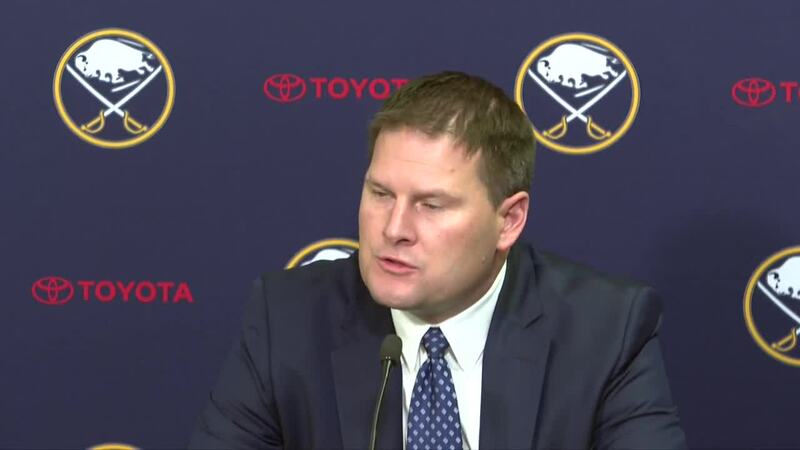 Just hours after the news became official, Botterill field questions from reporters and explained his decision to move on from Housley after only two years with the organization. "In the end, I thought this decision had to be made for our organization to move forward," Botterill said. "We are all responsible for the success and failures of this organization. We are certainly not pleased with where we are at and our results this year. We all need to be accountable and not make excuses." Botterill said his decision was based strictly off results and more specifically the Sabres collapse in the second half of the season. "We had the same lapses defensively and with our structure," Botterill added. "At the end of the day, this a result driven business and we didn't get the results." "We appreciate Phil Housley’s effort over the past two seasons. He will always be a respected member of the Sabres organization, and we wish him and his family all the best moving forward. We support the decision made by Jason today. It wasn’t an easy decision, but we know Jason is operating in the best interests of the organization both short- and long-term. We are confident we share the same vision of bringing winning hockey back to Buffalo, which remains our expectation."